I attended the Model A & T gathering in Standish Michigan today with a fellow who owns a number of T's. I have yet to purchase one so I had lots of questions. Two things I found unusual as we studied the cars was the lack of an air filter and the installation on some of a hot air pipe. 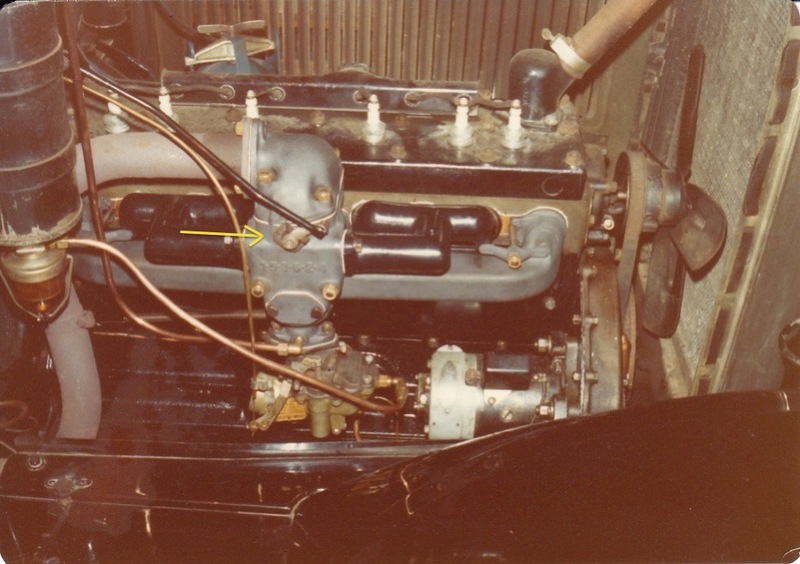 My dad's 1927 Hupmobile had a hot spot manifold whereby you could direct exhaust heat around the intake above the carburetor. It was controlled by a knob on the instrument panel. You pulled the knob which was connected to a rod that operated the damper. See yellow arrow. 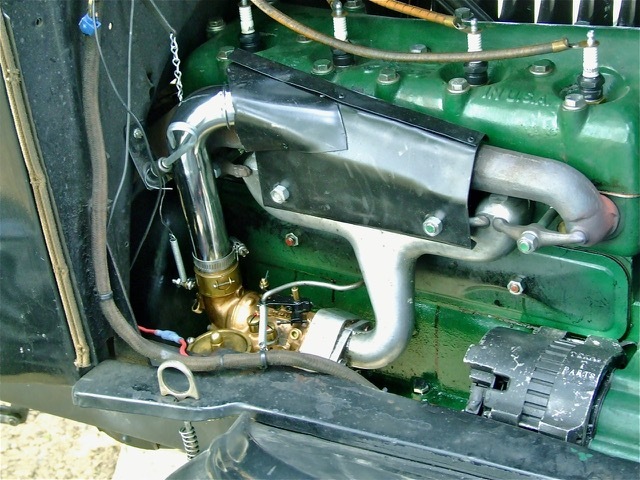 Most other cars had a fresh air port, sadly lacking on the T hot air pipe. There is or was on ebay one that someone added a sliding fresh air port in the last couple of weeks. They work when they are needed but are a pain to take off when not. Tim, you're unlikely to get flamed here, we're a pretty mellow bunch. Ford recommended taking off the hot air pipe during the summer, and some here follow that advice by removing it and adding an air cleaner with great success. I, on the other hand have tried this multiple times with my T, and it just hates it, so i leave it on to placate her. She likes what she likes, I'm just a caretaker and a passenger it seems. Here in MN, I leave my NH hot air pipes on year 'round because of the cool air in spring and fall and the humidity in the summer. I like your ideas Tim. I took mine off and added an air filter. Once that care gets up to temp, there's enough hot air in that compartment to prevent carb icing. Of course it may help that I also have my dust pans installed as well. Can't remember that I have ever had an icing issue. In Florida the intake manifold will ice up when it's 90 and the car is at normal operating temperature without the hot air tube on most, but not all, of my cars. Never could figure out why some do and others don't but I run hot air tubes on all of them now. According to the FAA, the highest potential for carb icing is at temps below 70� and humidity above 80%. That's not to say it can't happen other times. I wonder if some of the perceived performance improvement some owners see from the hot air pipe isn't due to the richer mixture resulting from the warmed air? Regardless, it certainly took a lot more skill and knowledge to operate a Model T than today's cars. Thanks for your comments...it has given me a lot to think about. Tim, I put a Stromberg OD-1 on my 24 TT. It was bigger in most directions. 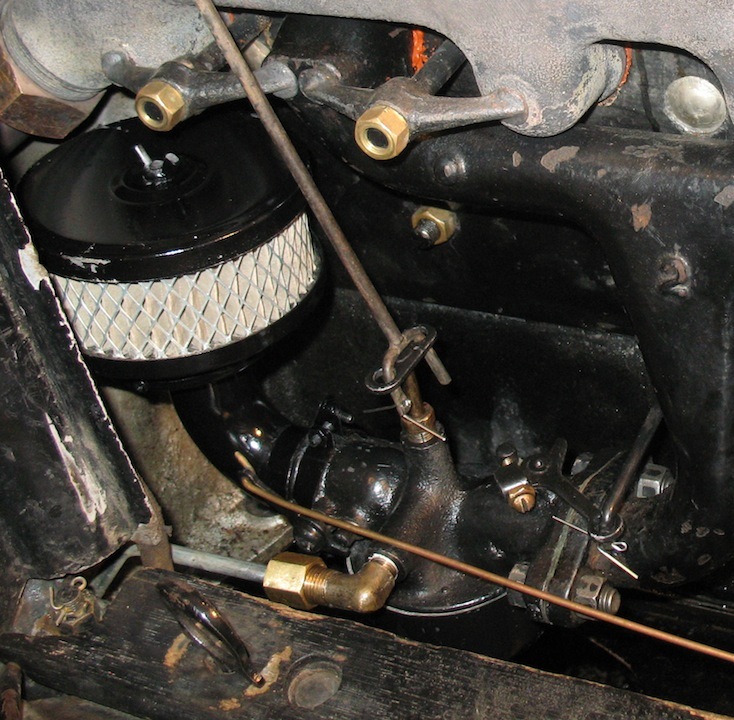 With all the adjustments; the throttle plate turned backwards, the throttle outlet was larger than the 13 aluminum manifold and the inlet was very close it the firewall. I didn't want things to drop down the inlet so I ran down to ACE hardware and picked up an inch and a half sink drain and split the smooth end and used a hose clamp to hold it in place. The black cover is made of Ace's finest 18 gauge rolled steel.there are three pieces held together with Pop rivets. I'm not concerned with air filters on the truck, the streets are mostly paved today. Because I run on country roads a lot, I use an air filter in place of a hot air pipe. No trouble with icing so far. Maybe the conditions aren't right for it. Steve maybe your are getting your air warmed from the exhaust manifold with the filters in close proximity to it, maybe to less extend then the stove but warmed just the same. Steve maybe you want to keep close tabs on that paper filter being kind of close to the manifold and exhaust? Does it do ok there?